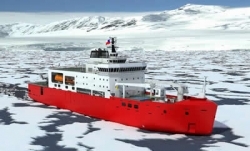 GE’s Marine Solutions has been chosen by Asmar Shipyards to provide an integrated marine propulsion system for the Chilean Navy’s new Antarctic icebreaking Polar Class vessel. It will replace the retired icebreaker to continue the Navy’s Antarctic expedition for search and rescue missions, scientific research, logistics support and resupplying bases in the Chilean Antarctic Territory. The 110m-long vessel will be powered and propelled by GE’s full marine propulsion system, including diesel-electric propulsion; GE’s International Maritime Organization Tier 3-compliant diesel engine, which reduces emissions up to 70%; a complete propulsion shaft line and propeller; a tunnel thruster; SeaLyte dynamic positioning; and vessel automation system. The vessel has received Lloyd’s Register PC 5 Polar Class notation, reflecting its icebreaking capability. With an installed power of 14.5MW, it will be capable of breaking 1m of ice at 3kts. “The ice-going capabilities require the machinery on board the vessel, such as the main propulsion, to be highly robust to ensure the safety and survivability of the vessel. That is not all. Given the vessel’s specific mission profile, we are also looking for clean propulsion technology that will meet the requirements of the highly stringent environment regulations in the Antarctic area. 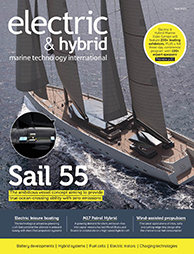 GE’s one-stop solution is the answer to all these challenges,” said Lieutenant Commander Jorge Maldonado, project manager for the Chilean Navy.